550 Squadron Lancaster EE193 / BQ-C was lost on a raid to Stettin 29/30 August 1944. 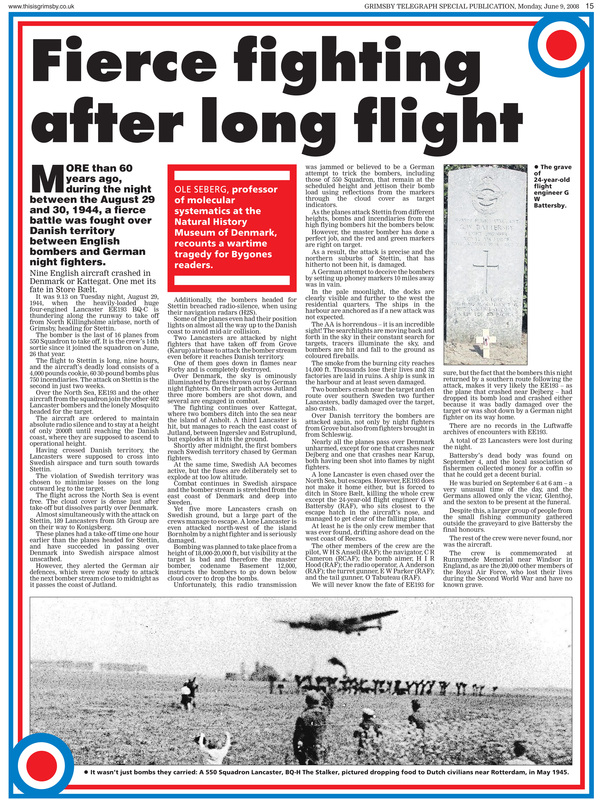 Airborne at 21:13 on 29 August 1944 from North Killingholme it crashed in the Baltic (Kattegat north west of Sejerø) on the return leg. When lost this aircraft had a total of 310 hours. Six, including Sgt Tabuteau who came from Banff in Alberta, are commemorated on the Runnymede Memorial, while F/Sgt Battersby is buried at Reerso Churchyard, 9 km WSW from Gorlev in Denmark. 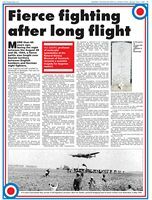 The following article, written by 550 Squadron Association member Ole Seberg (Professor of Molecular Systematics at The Natural History Museum of Denmark, Copenhagen Universtity) appeared in the Grimsby Telegraph (Special Edition) in June 2008 detailing the last flight of one of the nine Lancasters that came down over Denmark that night. Only the body of F/Sgt Battersby was ever recovered. Further details about the flight, including the possible location of the crash are available at: http://www.airmen.dk/e777274.htm. F/Sgt Battersby now lies in a Commonwealth War Graves grave in Reerso Churchyard Denmark: see http://www.cwgc.org/search/certificate.aspx?casualty=2271473.